Firewood, Ginormous Eggs, a Farewell to the Roos, and a Broody Hen? 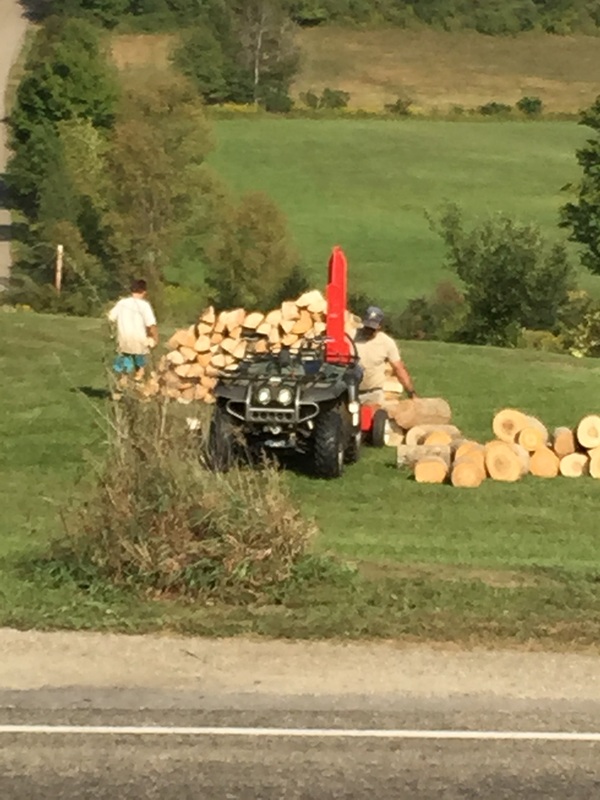 Little Dude helping his dad split and stack firewood. It’s been a busy week here on the farm. There’s been more canning (peach jam, tomatoes and more apple butter), fire wood to chop and eggs to gather. We had a cook out for Labor Day weekend, and invited half the neighborhood. They didn’t all show, but those who did had a pretty good time, despite the heat. I spent most of that day worried about the chickens because it was so hot, and wound up feeding them frozen mango to help cooling them off. One of the little hens actually stopped laying for a day due to the heat. Poor little thing! Another hen surprised us by laying the biggest egg I’ve ever seen. I’m not sure the pictures I took did it justice, but the thing was like two jumbo eggs combined. This week’s egg cart. HUGE egg is on the left, bottom. These two, compared with quarter are the normal sized eggs we’ve been getting. Yes, this quarter next to it. The thing is HUGE. And of course, the heat wasn’t helped by the fact that my RiR roosters were ALL really starting to ‘feel their oats’ as ‘mature roos’ and were seriously getting under skin. It’s been since June (when the Gold Sexlinks started acting up) since I’ve had this much chaos in the coop, and I only had 9 roos this time around. Not 17. In one of my last posts, I described the unwanted antics of one of my RiRs. The last week and a half since that post have seen ALL 8 of the little shitheads behaving the same way. In addition, several of them have taken to following me or Little Dude around the barnyard, run and coop at feeding times, growling and challenging us. I personally have been more annoyed than impressed. Until yesterday, when I went down to feed them and discovered that one of the hens had laid an egg out of a laying box and someone had stepped on it, leaving a big hole in it. My first thought is how much chaos has been in the coop recently. The RiR roosters will chase any hen they see, and have recently taken to chasing them up into the beds. We solved the problem yesterday morning by finally butchering the last of the roosters. Except Dots, of course, who is spared by the virtue of being Little Dude’s favorite. This should be the last round of butchering for a long while. We don’t intend to get more roosters, unless some day, I decide to hatch chicks and there are roosters there. And speaking of hatching eggs… I think my Abigail is going broody. She spent yesterday, all day, in her laying box. She isn’t laying an egg, she’s just laying on the plastic Easter egg put in the boxes to encourage the little girls to lay. My little Abby girl in her favorite box. I took her out, and here she is perching on my arm. I took her out of the box this morning when I came down to clean the coop and fill feeders. She got up, ate a little, drank a little and then hopped back in her box. While she’s in her box, she fusses and coos, but this not anything out of the ordinary. She always does this. I’m not sure if this is broody, or something else. Abby is about 6 months old now, and has been laying since August 8th. I’m not really sure what I should do. Your Abby may be broody 🙂 If you don’t want her to stay broody, just make sure there are no real eggs under her each day. I believe she will finally decide to stop sitting in an empty box. That’s what has worked with mine that have gone broody. They tend to give up when there are no eggs under them. I don’t think a broody hen will lay while they are broody, but you do have to check for eggs, because the other ladies will lay an egg in there when she gets up to eat. You may actually want to take the plastic egg out until she stops, because she may think it’s a real egg she’s sitting on. Right now, she has a plastic easter egg under her, because we put them in to ‘show’ my hens (all my flock are first-timers) where to lay. So this is what she is laying on. She did not lay yesterday, or today, but she is constantly in that box. I don’t think anyone else has had a chance to get in it to lay one. Should I remove the plastic egg, or let her lay on it until she decides it won’t hatch? I have a chicken that becomes broody every couple of months, she makes similar noises to yours when I disturb her. To break her broodiness I have to physically stop her from being able to get in the box. She doesn’t care if there are eggs there or not she just wants to be in the box. I segregate her, give her food and water and each day near the end of the day I let her out and test to see if she runs back to the box. It normally takes 3 or 4 days of locking her away. Depends on how quickly I catch the broodiness starting. She is really clever/persistent when she wants to get back to her invisible babies and can scale great heights and squeeze through tiny places, she is like houdini! I hope yours is not as bad as she is. The other chickens only need a day away to break. It does make me feel incredibly cruel as she frets for her babies but she sits in there all day and gets dirty and loses weight and just generally doesn’t look after herself. I kinda wish I could get fertilised eggs and let her become a mamma. Sorry about the essay! hi – thanks for leaving likes for me yesterday – just got around to having a look at this – the only reason to stop a hen going broody, and she is, is because you need her eggs. Doesn’t sound like you do, so why not let her be. It sounds like the ‘roos’ you slaughtered were probably old enuf to have fertilised some eggs – you might be able to tell if when you crack them, there is a red spot in the egg somewhere – in which case, just give her some of last week’s eggs to sit on, and you may get some chicks sooner than you expected! Or buy in some fertile eggs for her? Otherwise, the advice of your other readers is correct – just take the false egg out of the box and keep getting her out of the box to feed etc, and she will give up! Pity tho – as a natural hatch is the best thing you can have! I’m sure that some of the eggs were fertilized. Those boys were very active last week. It’s been sooo quiet without them. not sure, but its quite likely – but not worth trying to hatch eggs more than a week old – and that’s the max! saw your other comment too – of course if you don’t want any chicks now, then that’s fine! Well, it can’t hurt to ask, right? 🙂 If the situation changes and we decide to let her/another hen brood, I’ll know I could possibly try the less-than-a-week old eggs. I’ve been asking a lot of questions in a lot of places to try and decide how to handle this. I really didn’t want to put her in a crate, but I really don’t ‘need’ chicks right now, and also, we aren’t equipped to separate the hen and chicks from the flock while she raises them. I do have the brooder box we raised these ones in when we bought them, but that would involve separating Abby from her flock entirely until her chicks were ready to integrate. It wouldn’t be ideal. Someone in a Facebook group mentioned that her hen simply built a nest for her chicks on the floor of her her coop and no one bothered them all winter. I guess I could deal with that happening. So I have that on my mind, too. I’m sure there will be a ‘next time’ and we can decide what to do when it arrives. Today, I let Abby out of the crate. She went back to the laying box she favors 2 times during the day, and I found her in it tonight at bedtime. But in the between times, she’s been hanging with her sisters. I’m not sure whether this means she is getting over it, and I can let her go over night, or if leaving her near it will mean a ‘relapse.’ Does such a thing happen? She spent the majority of today with her sisters and with Dots. He kept a close eye on her because I think he missed her. It was very nice seeing her wandering around with her sisters, too. she is still broody, but the crate is definately NOT a good idea! If there are no eggs for her to sit on, she will give up, and anyway, she would probably wait for a few eggs in a box, so its normal that she would be sociable anyway. So if other hens are laying in her favourite box, take them out asap! Otherwise, if she hasn’t been bothered by the other hens when she was ‘sitting’ before, I would reckon if you want to just let her get on with it, it would be OK for her to stay in her preferred box, and put a clutch of eggs that are likely to be fertile in there for her! Its a good idea to let her come off the nest and feed and socialise for a while anyway, so its best not to totally separate her – but better to have her in a corner that won’t be disturbed too often. If the eggs hatch in 21 days, you can always move them all then to a separate pen, but ‘mum’ does need to wander a bit to keep her circulation going, so a small crate is not a good idea. she will probably go off lay for a bit now anyway as her hormones have been disturbed, but will resume soon enuf.